AC12.8SET is an AUDIOCONTROL12.8 with the AC12.8FP feature pack already built-in. The AUDIOCONTROL12.8 matrix controls much more than your audio! You can have different sound sources in different zones at various volume levels, do selective paging and on top of that control other devices as well. Briefly: your all in one audio and control center. The Feature Pack expands the functionalities of the AUDIOCONTROL with message player/recorder, logical inputs & 0-10V inputs, logic outputs, output delay and zone combining. 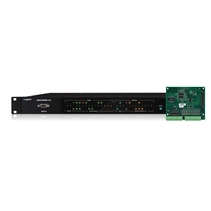 For more information about this AUDIOCONTROL SET, please check the product pages or technical sheets of AUDIOCONTROL and Feature Pack. 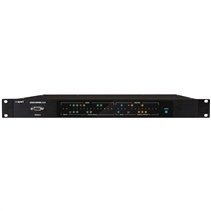 AUDIOCONTROL12.8 is a DSP powered audio matrix for small and medium sized audio applications, featuring advanced control of audio processing and routing with control of other (non-audio) devices which is unique on the market. 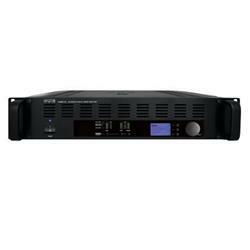 The audio matrix system has 12 inputs, 8 line outputs and a digital stereo SPDIF input and output. There are 3 serial ports (one on the front and two on the rear of the unit) to configure the unit and to control external devices. The AUDIOCONTROL12.8 uses a fixed architecture DSP platform meaning that the audio path has the same fixed flow for all inputs and outputs. The integrated real time task scheduler can perform a variety of tasks that means the AUDIOCONTROL12.8 is suitable for many projects. Up to 120 addressable/programmable paging microphones/extenders can be connected, each with their own functionality and individual presets and up to 8 priority levels. The AUDIOCONTROL12.8 has 12 analogue inputs where 6 of them are on balanced euroblock and 6 on RCA. All inputs are configurable to be mono or stereo. Input 12 can either be used as a normal source input or as a paging microphone input via the RJ45 connector. You can easily adjust the gain, EQ and dynamics on the input via the pc based Graphical Installer Interface. 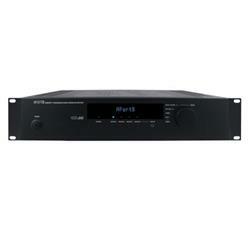 The 8 line RCA outputs can be configured via the GII to be mono, stereo, 2.1, mono crossover or stereo crossover. Via the RJ45 connector you can connect up to 120 paging stations. DIMIC12 is a fully programmable control and paging station for the AUDIOCONTROL12.8 where each button can be programmed individually. DIMIC12 allows you to page zones individually or page a group of zones but also allows macro recalls or control of some audio functions like source selection, zone muting or volume up/down. 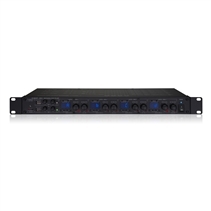 An expansion panel, DIMIC12S, provides you with 12 extra programmable buttons (a maximum of 7 DIMIC12S paging stations can be connected to one DIMIC1 or DIMIC12).A maximum of 8 DIWAC’s (Digital Wall Controller) can be connected via a 2 wire cable. The DIWAC can control audio and control functions and is very easy to program via the GII. Use the select UP/DOWN buttons to select functions and the +/- buttons to enable or disable functions or to bring the volume up or down. The serial control port allows control via any touch panel control systems or when adding a NETKIT-RS, a very cost effective touch panel control with a tablet or smart phone is possible. 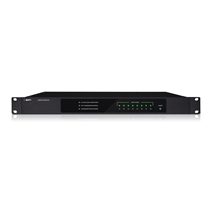 The AUDIOCONTROL12.8 functions straight from the box without connecting a laptop or the need of programming. When you start with the out of the box configuration you will have 5 stereo line inputs and 4 stereo output zones. Optionally you can connect a DIMIC1 for all call or a DIMIC12 to do selective paging to 4 zones. If you need local control of source select and volume, you can connect up to 2 DIWAC wall controls per output zone. Via the GII (Graphical Installer Interface) you can do the entire configuration of the AUDIOCONTROL12.8 and the programming of the functions of the other devices you want to control. The set-up is so easy that every integrator is able to program it. The audio monitor allows you to listen to the audio, no matter where you are in the signal path. Once your settings have been done, you can make a printout so that the installer exactly knows where to connect which sound source, zone amplifier or wall control. The configuration can also be saved on your computer as back-up and you can copy it easily to other devices. For advanced programming of the AUDIOCONTROL12.8 you need to have an Expert Level access code. The expert code can be supplied via your distributor. In Expert Level Mode, you have full access to the EQ settings and dynamics, you can program the functions of the paging station buttons and wall controls and you can program and recall macros. Once your configuration is made in Expert mode, your installations are protected and can only be altered by other people that have an Expert Level Access code. It even allows you to lock the AUDIOCONTROL12.8 so that only people from your organisation can make changes to the settings using your password. Linking a second or even third AC12.8 (as slave) can extend your system setup up to 16 or 24 outputs. Please note that only paging facilities are linked between the master and slave units. The number of available inputs remains at 12. Although it can look quite simple, a small multi-zone installation is not always an easy or small job for the installer. He needs to install and connect many electronic units (sources, amplifiers, wall panels…) in order to provide the perfect audio solution for his customer. With Apart’s AUDIOSYSTEM8.8 the installer now can propose a complete audio system to his customers that covers many small or medium sized applications… with just one unit! The Made in Belgium AUDIOSYSTEM8.8 audio matrix has 8 speaker outputs (4 stereo or 8 mono zones) with each a built-in 30 watts digital amplifier and also has 4 additional line outputs. The unit has 4 FM radios built-in and it has 4/8 stereo/mono line inputs. Out of the box the AUDIOSYSTEM8.8 is configured with 4 stereo inputs en 4 stereo output zones. The installer/customer can easily access the integrated web server based GUI to configure and/or control the audio system. AUDIOSYSTEM8.8 can be remote controlled via the DIWAC wall panels, but thanks to the web server based GUI also via any mobile device (smartphone, tablet) or computer that has a web browser installed. Browse to the correct url and when the GUI opens, it’s a piece of cake to select your source and control the volume of your zone. As AUDIOSYSTEM8.8 is a perfect solution for many retail (or corporate) applications, the unit has been equipped with an emergency mute contact. In a shopping mall for example all retail stores should be connected to the central PA system. When connected via this emergency mute contact, the emergency messages coming from the central audio system will overrule the music in the shops when needed. Furthermore AUDIOSYSTEM8.8 has an all call paging functionality and a party mode function. On the DIWAC wall panels, an ALL OFF button can be selected to shut down the entire audio system. The applications for AUDIOSYSTEM8.8 are almost endless: doctor or dentist cabinets, supermarkets, bars and restaurant, office buildings, hotels, sport centres, wellness areas or schools… AUDIOSYSTEM8.8 stands for easy configuration, straight forward control into endless applications! The sophisticated pre-amplifier ZONE4 allows you to control four stereo zones with just one affordable unit. In any of the 4 zones you can play music that comes from one of the 4 music sources you can connect. There is also the possibility to assign 3 microphones to each zone where MIC1 can be a dynamic priority mic (via contact closure) or a 4-zone selective paging microphone (MICPAT-4). 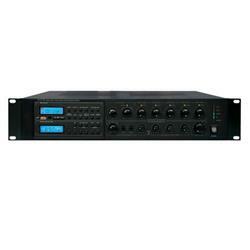 Each signal is assignable to any of the four output zones through dipswitches on the front and the back of the unit. Phantom power supply on MIC 1 & 2 can be activated via a dip switch. The ZONE4 can be controlled from the front panel (with digital display), via the RS232-connector or via the IR serial. On top of that you can control the unit via the ZONE4R remote control panels. Thes control panels have a clear LED status display and buttons for music level, MIC/MIX level, source select and mute controls. Because the remote is wired with a normal CAT5 cable, it is very easy to install. On the output side, there is a line input selector and music level control per zone. A clear digital display makes it easier to monitor the functioning of the unit. Further, there are independent MIC-MIX level control and bass-treble control per zone. The unit is 19” format and comes standard with removable brackets. The removable metal cover (included) protects your MIC-settings.